Sacred Heart Guardians and Shelter (SHG) facilitates communal Embryo Remains Burial for embryos who die* in IVF labs and clinics. *Causes of death may include: self-arrest of embryo during development from fertilization to intended transfer/freeze day; discard due to poor grade or PGD/PGS result; failure to survive cryopreservation or thaw process; cryopreservation equipment malfunction; patient-elected thaw without intent to transfer or make available for adoption. Please note that SHG’s Embryo Remains Burial is not a “disposition option” for “excess” frozen embryonic persons (i.e., it should not be considered alongside options of: adoption by another person(s), donate to research, thaw for discard). Rather this service provides an alternative to the usual practice of medical waste disposal. SHG’s burial services ensure respect for the embryo’s humanity and perpetual remembrance. We know that for some people, thaw without transfer or adoption seems the only feasible path. We provide burial for embryos who pass in this manner, but would like to stress that SHG’s Embryo Remains Burial should not be used as a factor in the decision to thaw a living – albeit frozen – embryonic human being. • SHG outreaches to IVF clinics, asking that the clinic present the option of burial to its patients for any embryo who passes away in their laboratory. • When a patient informs the clinic that they would like the remains buried by SHG, the clinic ships the remains to our Minnesota office. • Patient-identifying and contact information are not required for use of SHG services. Any materials (gravesite ID, grief pamphlets, etc.) may be sent directly to patients, or to patients by way of the IVF clinic, depending on patient-indicated preference. • Once SHG receives the embryo remains, they are brought to a licensed funeral home where they are kept until the day of the burial. Burials are held at 10 a.m. on the Saturdays listed below, in conjunction with Fetal Remains Burial for families who have experienced a miscarriage. Each burial begins with a service in the Resurrection Cemetery Chapel Mausoleum followed by a procession to the grave site. Attendance by the family is not a requirement for having remains buried by SHG. We offer it as an opportunity for remembrance and healing. Families of all faiths are invited to participate. 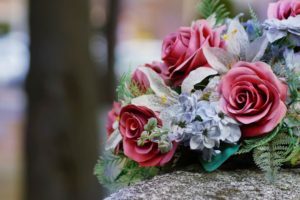 Should a family prefer to visit the gravesite on a day other than that of the burial, they are welcome to visit as often as they like during regular Cemetery operating hours. Contact SHG at 612-578-0377 or info@sacredheartguardians.org for assistance locating an embryo’s gravesite location. Resurrection Cemetery is located at 2101 Lexington Avenue South, Mendota Heights, MN 55120. For information and directions to Resurrection Cemetery, Click Here. Sacred Heart Guardians is grateful for the support and services provided by the partnership of The Catholic Cemeteries, specifically Resurrection Cemetery and Gill Brothers Funeral Homes. For more information, contact Laura at 612-578-0377 or laura@sacredheartguardians.org.